This week we turn our attention to another type of sushi, the maki or roll sushi. This set consists entirely of the larger rolls, or futomaki as they are known in Japanese. They’ve used the uramaki technique where the layer of nori seaweed is on the inside of the sushi, instead of on the outside. The ingredients include a mix of prawn, avocado, cucumber and red pepper. They are really colorful and look tasty! We dive straight in. The quality of the nori they’ve used is good, and the rice is great too. 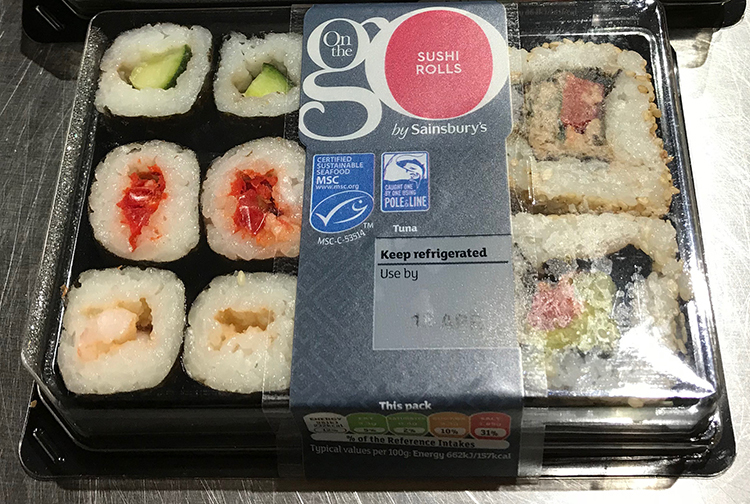 But… they’ve gone down the California roll route by using mayonnaise, resulting in a dominant oily taste and an unpleasant aftertaste. A pity. At this price, we weren’t expecting much. 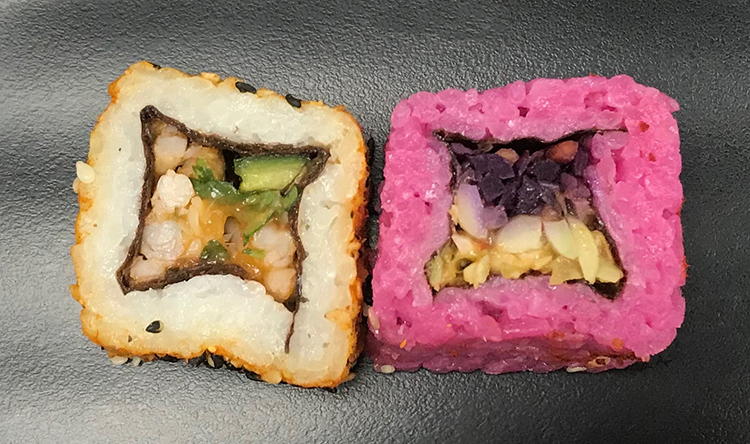 The shape of the futomaki is irregular and there are gaps between the fillings and the rice, so first impressions were not impressive. And just as we expected, the nori is thin and unpleasant tasting. The rice is hard and the tuna filling isn’t great. The green futomaki seems to contain an experimental mix of avocado and edamame, but the taste and texture are not entirely successful. The fillings of the thin hosomaki were just tasteless, and a gloom fell over your tasting team as they ate them. Total downer! 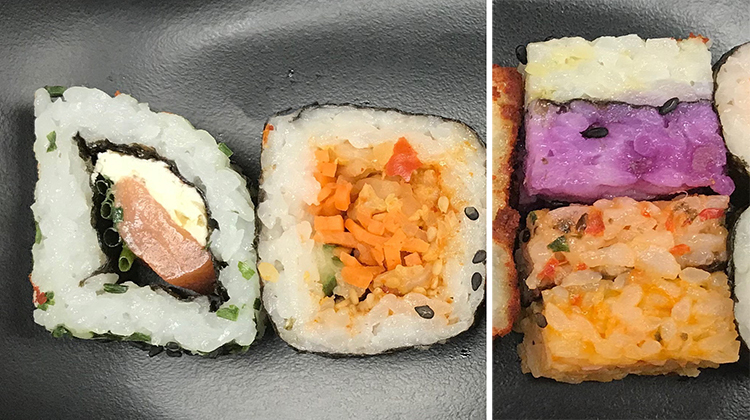 Of all the sushi we bought this time, these were the most colorful and eye-catching. The rolls look substantial, so we were looking forward to biting in. 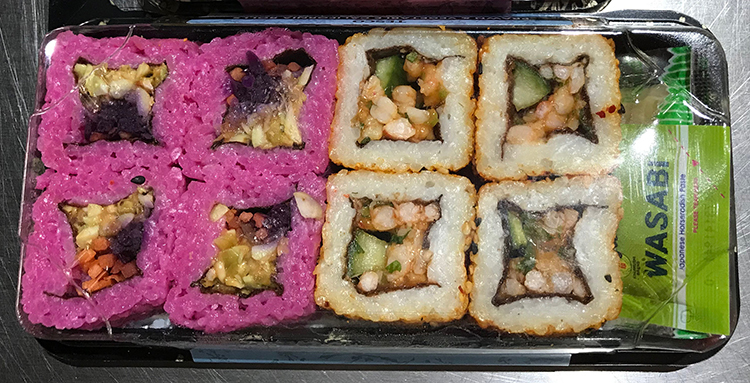 But… perhaps they over-mixed the rice when adding the colours, because the individual grains were broken and clumpy like a soggy rice cracker. The fillings (prawn, coriander, cabbage, carrots) were a bit uninspired too. So, our expectations were betrayed and none of your team could face eating more than one of these. 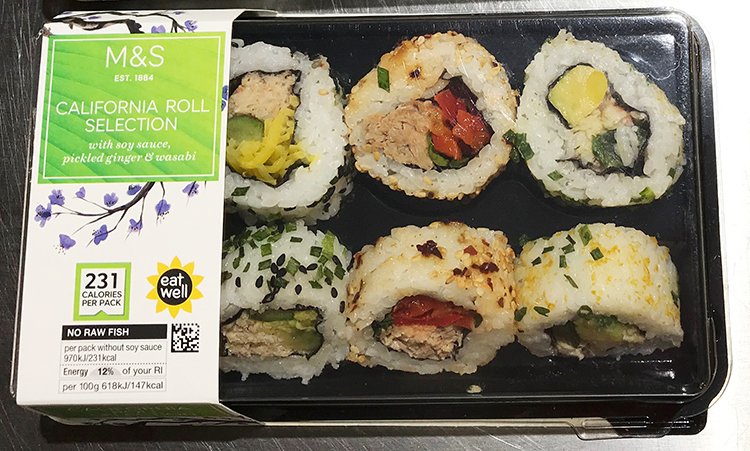 Which brings us to Morrisons, who did so well in the nigiri taste-test. The sushi comes in a mixed pack with some nigiri too. 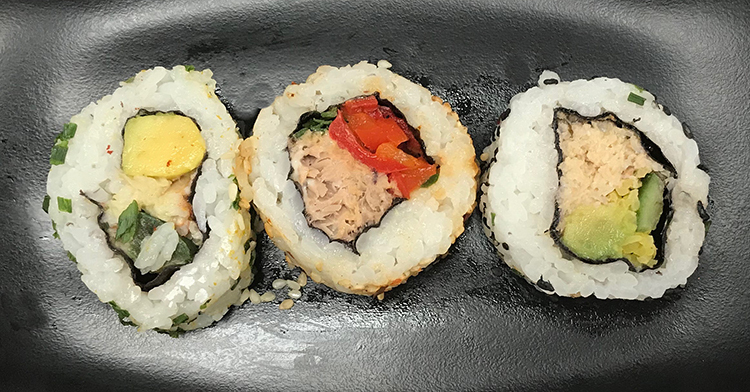 The maki include Western-style salmon and cream cheese, as well as Korean-style kimchi. When we examined the package later we found that it actually says “kimchee oshi”. Who even knew that this type of sushi existed?? But like Tesco, the rice had been squashed in the production process and wasn’t enjoyable to eat. It just didn’t feel like we were eating sushi. Honestly, for your Japanese tasting team, kimchi and sushi don’t go together. There was still a lot of sushi left on the table, but no one was reaching for it. That was probably the most telling moment of this particular taste-test. 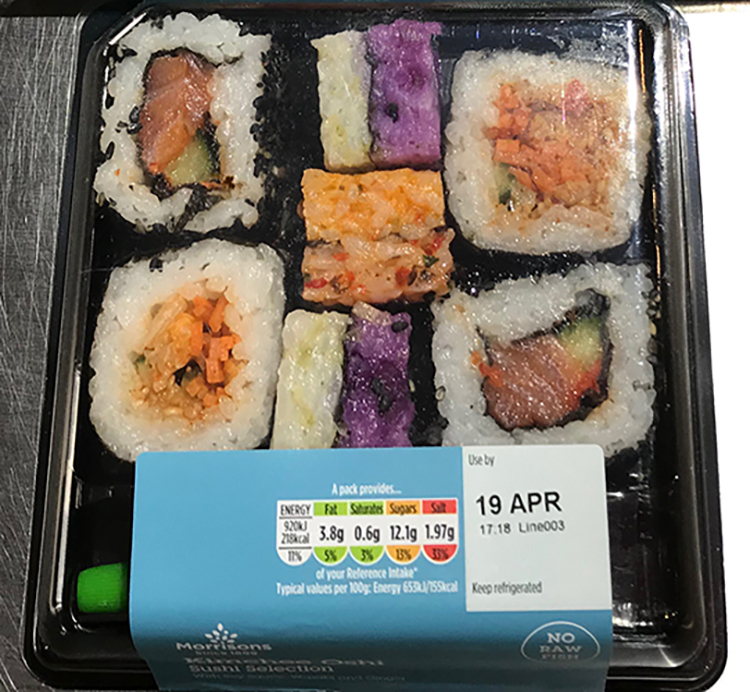 But, if you are absolutely determined to buy your sushi from a supermarket, our advice would be to look at the contents. Avoid the fusion sushi. Go for something simple and classic: prawn or salmon, ideally with no additional flavours. In spite of today’s results, your tasting team are not yet willing to give up on UK sushi. We will gird up our loins and the tasting will continue!